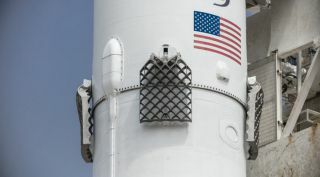 SpaceX used new titanium "fins" on its latest launch of Iridium Next satellites, replacing aluminum fins that experienced more wear during reentry. WASHINGTON — SpaceX intends to launch a final upgrade to the Falcon 9 rocket, known as the Block 5, later this year, and has three Falcon Heavy launches planned for the next 18 months. Gwynne Shotwell, president and chief operating officer of SpaceX, confirmed in a June 22 appearance on "The Space Show" online radio show that the Block 5 version of the Falcon 9 will be the "final design spin," following just a few months after an "incremental" Block 4 version that will be more of a transition model. SpaceX Chief Executive Elon Musk had previously stated in an online question-and-answer session in October 2016 that Block 5 would be the final upgrade to the Falcon 9 design. The Falcon 9 Block 5 is expected to be far more reusable than the Block 3. Shotwell said a Block 5 booster could relaunch " a dozen or so times." The Block 3, by comparison, has an estimated life of two or three missions. Shotwell said the Block 5 version of the Falcon 9 won't need refurbishing, but will mainly undergo inspections prior to launch, streamlining the process compared to the first reused boosters. "We've worked a lot on this particular vehicle. A lot of the active components, the valves, have been redesigned and requalified for much higher levels and much longer duration," she said. Despite describing the Block 5 as the final version of the Falcon 9, Shotwell hinted at the possibility of a future version of the rocket that could use the Raptor engines designed for transportation to Mars. Shotwell said Raptor, a liquid methane and oxygen engine for SpaceX's interplanetary spaceship, has undergone "many dozens of tests" and is progressing well. Shotwell said Arabsat will be the first customer for the Falcon Heavy when it begins commercial service in 2018, following a demonstration mission later this year. "We'll be flying Arabsat to [geostationary transfer orbit] on the second Falcon Heavy flight, and then we'll be flying STP-2, an Air Force mission," she said. Saudi Arabia-based Arabsat purchased a Falcon Heavy launch for Arabsat-6A, a Ku- and Ka-band satellite from Lockheed Martin, in 2015. The Air Force contracted the Space Test Program-2 launch in 2012. Shotwell described both those missions as happening "early next year." Delays with the Falcon Heavy cost SpaceX two of the rocket's customers: ViaSat and Inmarsat. ViaSat's ViaSat-2 and Inmarsat's S-band European Aviation Network (EAN) satellite both shifted to Ariane 5 rockets from European launch provider Arianespace. ViaSat-2 launched June 1, and Inmarsat's EAN satellite launches June 28. SpaceX still needs Space Launch Complex 40 at Cape Canaveral Air Force Station to finish repairs before the Falcon Heavy can launch. That infrastructure, often referred to as Pad 40, took damage last September when a Falcon 9 exploded during a fueling procedure prior to a static-fire test. Shotwell said Pad 40 remains on track for completion later this summer. Once reactivated, SpaceX plans to return Falcon 9 launches there and use Launch Complex 39A for Falcon Heavy. SpaceX does not intend to fly any customers on the maiden flight of the Falcon Heavy. Shotwell said the mission will demonstrate some capabilities needed for national security launches, such as an extended coasting of the second stage. The first Falcon Heavy launch will use two previously-flown Falcon 9 first stage boosters attached to a new center core optimized to support the triple-booster configuration. To date, SpaceX has launched two Falcon 9s with "flight proven" first stage boosters, flying SES-10 in March and BulgariaSat-1 June 23. Shotwell said three to four more customers are interested in using flight-proven launchers this year. If SpaceX launches a minimum of three additional pre-flown boosters this year, along with two pre-flown boosters on Falcon Heavy, that would amount to seven reused rockets for 2017. Shotwell said SpaceX was originally shooting for six reused boosters this year. Shotwell said in March that SpaceX would seek to use pre-flown boosters as a means of easing the strain on Falcon 9 production. Production was slowed by the September 2016 anomaly, but has increased significantly since then, she said. "Three years ago or so we were producing six rockets a year," she said. "This year we are going to produce more than 20." Shotwell said SpaceX desires to eventually fly pre-flown boosters "far more regularly" than new models. She said some customers are waiting for SpaceX to certify pre-flown boosters for national security space missions and for crewed missions before agreeing to use them.